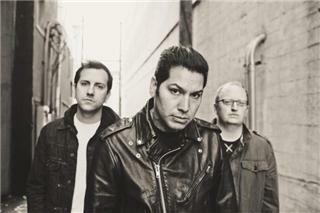 Since MxPxs inception in 1992 in the blue-collar naval town of Bremerton, Washington, the triovocalist/bassist Mike Herrera, guitarist Tom Wisniewski and drummer Yuri Ruleyhave been mainstays in both the pop-punk and punk-rock scenes thanks to a prolific back catalog and road-warrior mentality. That youthful exuberance and appetite for success can be found all over POKINATCHA, the bands 1994 Tooth & Nail Records debut release. Bursting with speedy, pit-ready anthems, the discs 21 tracks showcased a band with some serious punk-rock chops that still had a knack for melody. True to the bands punk-rock roots and hard-charged work ethic, their follow-up album hit stores a mere 10 months later. TEENAGE POLITICS was the first to feature Wisniewski, who stepped in on guitar after Husted was asked to leave the band in 1994. Shortly after the Teenage Politics sessions wrapped, the band returned to Seattle to record the aptly named ON THE COVER, marking MxPxs first EP. The eight-song disc featured MxPx putting their trademark punk-rock spin on classics. With the success of singles Move To Bremerton and Chick Magnet, their third T&N release, the seminal LIFE IN GENERAL, is still today hailed by many as their definitive work. In 1997, the band signed to A&M Records and released SLOWLY GOING THE WAY OF THE BUFFALO, in 1998, which went gold. The band took a decidedly different turn for 2000s THE EVER PASSING MOMENT, choosing to favor 1970s powerpop a la Elvis Costello instead of the double-time SoCal punk they grew up on, featuring lush harmonies, slower tempos and even a cameo from Foo Fighters frontman Dave Grohl (The Next Big Thing). The albums first single, Responsibility, gave the band another hit, peaking at No. 24 on Billboards Modern Rock chart, and The Offspring hand-selected MxPx to open their fall 2000 tour. The bands emerging pop tendencies were fully realized on 2003s BEFORE EVERYTHING & AFTER, their third effort for A&M. Featuring guest appearances from members of New Found Glory, Good Charlotte and The Ataris, BEFORE EVERYTHING & AFTER was stacked with potential radio-ready singles. The biggest feather in the bands cap came when Diet Pepsi selected the track Well Adjusted for an ad that debuted during Super Bowl XXXVII. MxPx left A&M in 2005, and soon thereafter reemerged on Southern California indie label SideOneDummy. The label issued PANIC, the bands seventh album, in 2005, and MxPx once again spent the summer on Vans Warped Tour with the likes of Fall Out Boy, My Chemical Romance and Relient K.
The groups time on SideOneDummy was brief, and MxPx returned to Tooth & Nail Records, their original home, for 2007s SECRET WEAPON, the bands first studio album for Tooth & Nail in a decade. The band also appeased fans in 2009 with a second installment of the popular ON THE COVER seriesa collection of cover songs from artists like Descendents, U2 and The Go-Gosas well as a special Christmas-themed collection, PUNK RAWK CHRISTMAS, the same year. When it came time to release new original music in 2009, the legendary punk-rock act took matters into their own hands. The band retreated to Herreras Bremerton studio, Monkey Trench, and the result, the LEFT COAST PUNK EP, was classic MxPx. Marrying Herreras knack for strong melodies with the punk bite the band are known for, the albumwhich was released on the bands Rock City Recordings labelwas a short, snappy reminder that growing up doesnt necessarily mean mellowing out. In late 2010, nearing two decades of playing together, drummer Yuri Ruley questioned being in the band and performed what he thought would be his last performance as a full-time member of MxPx at Wasted Space in The Hard Rock Cafe, Las Vegas. At the same time, guitarist Tom Wisniewski turned in his part-time status as well, taking on a full-time job in Bremerton. Vegas provided more than a chance to reminisce about the past through their first full LIFE IN GENERAL live set. The sold-out show helped rekindle the spark of creativity, reaffirming that Ruley and Wisniewski would continue with the band but would drastically scale back on touring. In December 2011, MxPx released a music documentary, BOTH ENDS BURNING, which was directed by longtime fan and friend, Bryan Buchelt of Snaproll Studios. The film features footage from the bands 2008 world tour all the way to the bands sold-out Seattle show in March 2011. Ruley and Wisniewski have since remained members of the band and with Herrera, MxPx released their ninth full-length album, PLANS WITHIN PLANS on April 3, 2012 within the U.S. and Canada through MRI/Rock City Recording Company. In an industry with constant turnover flooded by flavors of the week and gimmicky artists looking to make a quick buck, its the ultimate accomplishment that MxPx have survived nearly two decades and still remain one of the pop-punk worlds most well-respected names.